My personal journey is my inspiration. 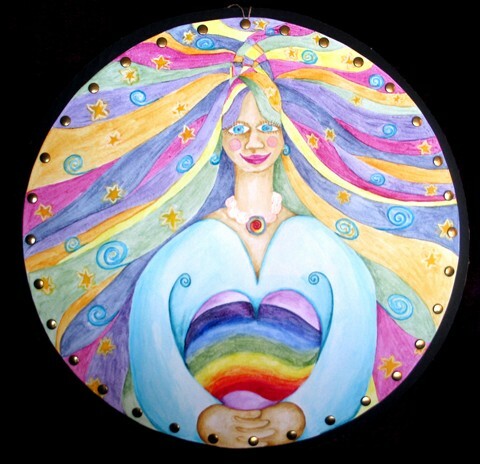 Part self portrait, Woman Flows free flowing way expresses love for self, earth and humanity. She leads from her heart with compassion, service, and knowing thyself. I am always looking for non-traditional presentation formats. Having the mandala hang allows for movement, freedom, and flow  transitioning, transforming, transmuting in higher levels of consciousness. I use both sides of the canvas for storytelling. Using childrens plant based paints has a pallet of vibrant colors that bring out a feeling of playfulness. The hand prints on the back side are the artists (my) signature as well as a representation that our hands are extensions of our heart. May Woman Flow touch you with love, joy and gratitude for our journey here on earth.